A prehistoric corpse entombed within an Arctic glacier, crying tears of blood. A jungle island overrun by rabid primates – escapees from a research laboratory’s hot zone. A massive seaplane hidden beneath a mountain, packed with a Nazi cargo of mind-blowing evil. A penniless orphan kidnapped from an African slum, holding the key to the world’s survival. Four terrifying journeys. One impossible path. Only one man to attempt it. Will Jaeger. The Hunter. Last year saw the release of book one in this series Ghost Flight (2015) , as you will see by reading my review it was by and large an excellent book, fast compelling, action packed and with great characters. Yes it had issues with the ending and a penchant forgoing overboard with the survival stuff (to be expected you may thing, but … well it still messes up the flow of a thriller). … So was there any improvement for Burning Angels? 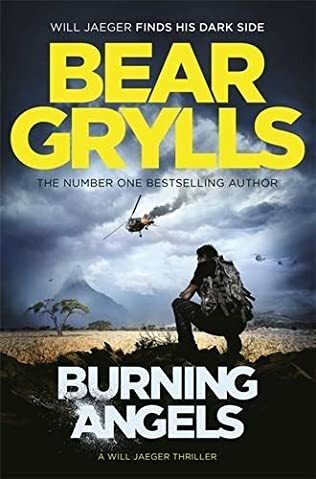 The survival stuff takes much more of a back seat, instead the author has worked harder on character development, plot pace and action. The tension as a result gets cranked up, the depth of plot really pays off, and i’m a huge sucker for a WW2 link. But unfortunately the author once again falls foul of the crash landing, the ending like the first book arrived like a reaper flying into a brick wall. I was really brought up short and can only think that the author was tied to a word count and wasn’t allowed beyond it for publication. Its the only reason i can think for the anticlimactic end to what had up until then been quite carefully delivered and built tension….. it was very much… ah you defeated me… ok, ending summary… bye. I’m not sure if that spells the end for Will Jaeger? i do hope not, i think the author has the right skills to produce a high level thriller and all the way to the end, given the word count, and this is a great character and group to do it with. This again 3/5… but closer to 4.